Back in 2011, when I reviewed Level Up for Tor.com, I made a note to keep an eye on Thien Pham; after the fantastic job he’d done illustrating Gene Luen Yang’s story, I was eager to see what he’d come up with next. 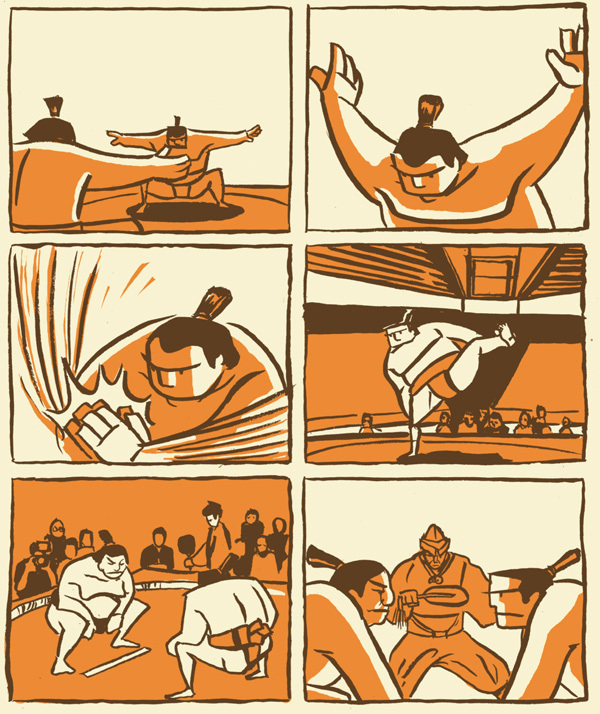 All I knew is that his first work as a writer/artist was going to be a graphic novel called Sumo. Well, now it’s out, and it’s as excellent as I’d hoped for. Sumo is the story of Scott, a young American who’s come to Japan to train as a sumo wrestler and has hit a significant turning point in his career: If he doesn’t win his next bout, he’ll pretty much have gotten about as far as he’s going to get. He’s got the body and the spirit, his trainer says, but he’s still second-guessing himself—and that might be his downfall. The artwork is deceptively simple. Pham utilizes a 2×3 grid throughout the graphic novel, occasionally deploying a “widescreen” panel, and within this structure his line is as basic as it was in Level Up, but it’s become tighter, more angular, and the color palette has become starker. The main storyline is tinted a reddish-orange, and Pham weaves in two flashback tracks, green and blue, that tell us about what brought Scott to Japan and his early efforts to adjust to a new life in a strange country. I’m still in awe of the expressive range that Pham achieves with just a few lines (and dots for eyes), and his cinematic storytelling sense here is fantastic. Sumo has a real flair for honing in on just the right images, and putting them together in a way that not only moves the story, but moves us to care about the story. The sumo bouts are dynamic, as you can see from the artwork above, but this is a story that hinges even more critically on its quiet moments of psychological and emotional realization, and Pham nails these beautifully. It’d be easy to compare Thien Pham to Adrian Tomine in terms of their focus on character, but I think that’s only a small piece of what’s going on in Sumo. Pham is sorting out his own visual grammar here, and the early results are extremely compelling.